In SharePoint Online, we will see the implementation of Remote Provisioning to provision the SharePoint artifacts remotely. With the introduction of Modern UI to SharePoint online, we were waiting for similar kind of functionality to be released, and now we have the Site Design and Site Script to help us support our custom configuration in Modern UI too. Microsoft is releasing the Site Design and Site Script features for SharePoint Online to Office 365 tenants. Site Design and Site Script are used to automate the provisioning of SharePoint site using our own custom configurations. 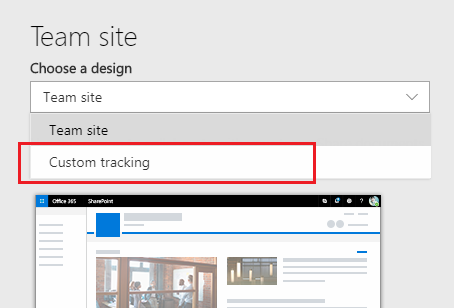 We can relate site design as a template, from which we can create a SharePoint site. This template will help us to have consistency across multiple sites to create for a similar purpose. Like the old feature of stapling concepts from the On-Premise days, we can attach our custom site design to any of the above templates. If we select “Communication Site”, it gives further options to choose the design template. These are the out of box Modern UI site designs, we can choose to create the SharePoint site. When we select the site design and click create the site, in the background SharePoint runs the site scripts for that selected site design to create the site. Site scripts are JSON files, which define an ordered list of actions to execute while creating the SharePoint site. Site Scripts can have 30 cumulative actions defined. From the attachment, use Apply-Theme.ps1 to install custom Cyan theme to your tenant. Or use the Theme Generator tool to create your own color theme. Also refer to the site-script.json from attachment. -Title "Contoso theme and list"
Note down the Id generated by the Site Script. -Description "Creates list and applies theme"
The WebTemplate 64 is for the team site. Add-SPOSiteDesign registers this site script with the team site template. We get an option to select any of the Modern site templates. We should see our custom site design listed on Team site. Select it to create your site. 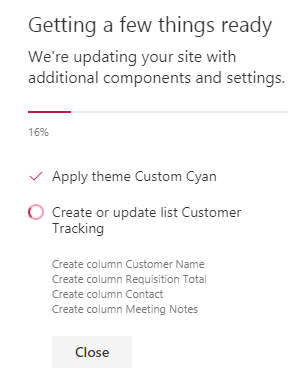 While provisioning the site, you should see your custom theme being applied and custom lists are being created. 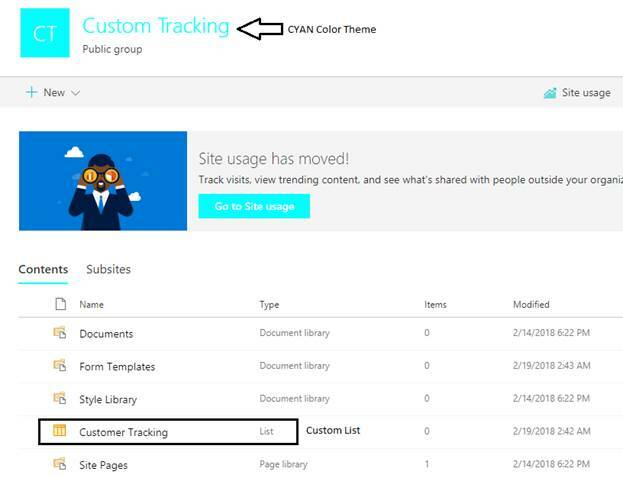 Once provisioning completes, navigate to site contents to see your custom lists created.